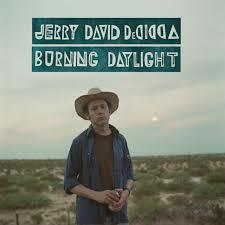 As a teenager Jerry David DeCicca had, by his own admission, an obsession with 40 something year old singer-songwriters. Listening to the likes of Reed, Zevon, Petty, Dylan and Springsteen informed the musical direction he was to take. Formerly with The Black Swans ‘Burning Daylight’ is DeCicca’s third solo release and it nods more than a little towards another of that ilk, John Mellancamp. For evidence of this look no further than ‘Dead Man’s Shoes’ with the jangly guitar intro, the influence of a powerful female backing track, provided here by Eve Searls, and its not insignificant subject matter of fighting depression. Here then, is the heart of the album in microcosm, great guitar riffs, subject matters that veer from the benefits of therapy ‘I Walked Here’ to seeing beauty in desolate times ‘Cactus Flower’ and that great female vocal. DeCicca is at his best on these up-tempo tracks and, whether by accident or design, these form the core of the album with tracks 5 through 8 segueing seamlessly one into the other. ‘Burning Daylight’ a song about valuing how you spend your waking hours precedes the aforementioned ‘Dead Man’s Shoes’. ‘I Watched You Pray’ expresses gratitude for a friend’s faith with ‘Bed of Memories’ completing this album within an album. That title track also allows us more of those wonderful Searls’s tones as she joins DeCicca on duet vocals. The other tracks have more variations in pace and give DeCicca’s distinctive vocals a different feel. Of these ‘Cutting Down The Country’ is the standout of the whole album with DeCicca adopting an almost spoken style to deliver a passioned cry against sprawl and suburbanisation. This vocal works brilliantly here alongside wailing guitars and a killer keyboard groove. A magnificent piece of songwriting of which Mr Mellancamp would be proud. The album was recorded live to tape and you have to love a record whose sleeve notes follow up this fact with the comment that “any mistakes you hear were created by humans playing music together.” DeCicca has five highly accomplished humans working alongside him here and together they have delivered an album that, if uneven in places, has a number of highlights that make it worthy of attention.